Nori, the seaweed used to wrap sushi rolls, is generally thought to be a one trick pony, if it's even thought of at all. 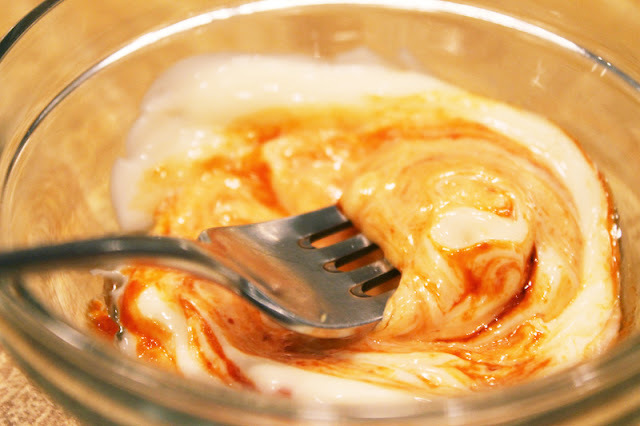 People generally come across it as an addition to a sushi and ramen, but beyond that, one rarely sees use for it. I had bought a package of nori sheets to make sushi awhile back, and after reading a post about a nori crusted steak on Rooftop Gourmet I decided to use it with some fresh tuna steaks. It's surprisingly tasty on it's own. It has a very subtle salty flavor and has a lot of vitamins and other dietary benefits, so it makes for an interesting and healthy addition to a meal. 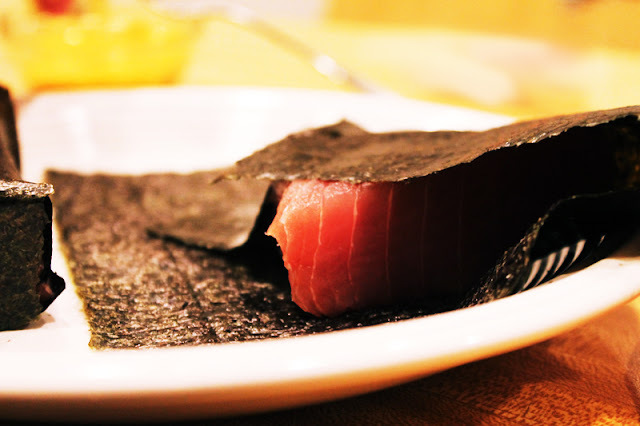 While very brittle when dry, it becomes very malleable and breaks down when wet, so wrapping it around a tuna steak is perfect because the nori sticks to the wet flesh of the tuna. I used about 1 sheet of nori per tuna steak and wrapped it up like a little fishy present. To go along with the fish, I wanted to make some fried shrimp, so I battered and breaded 2 shrimp each in panko crumbs and fried them in canola oil. 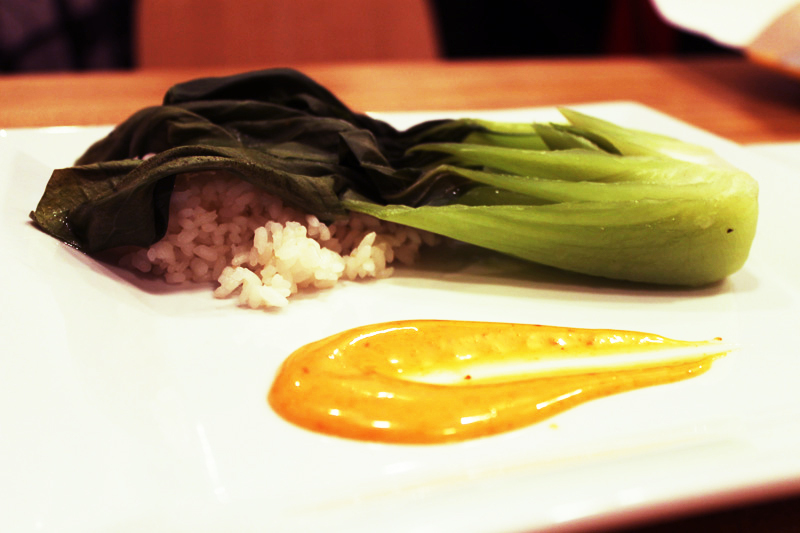 In addition to the shrimp, I steamed some baby bok choy over mirin and sake and made some white rice and spicy mayonnaise. 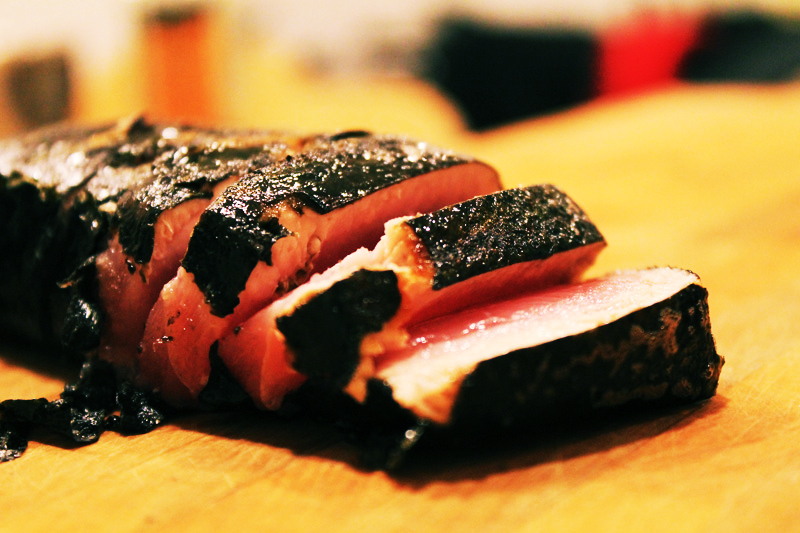 For the tuna, I heated a grill pan, and once hot, grilled the nori wrapped tuna steaks until the seaweed showed grill marks and the outside of the fish was just seared. I like my tuna to be very rare, so I only cooked each side about 3 minutes to sear the nori and the outside of the fish. 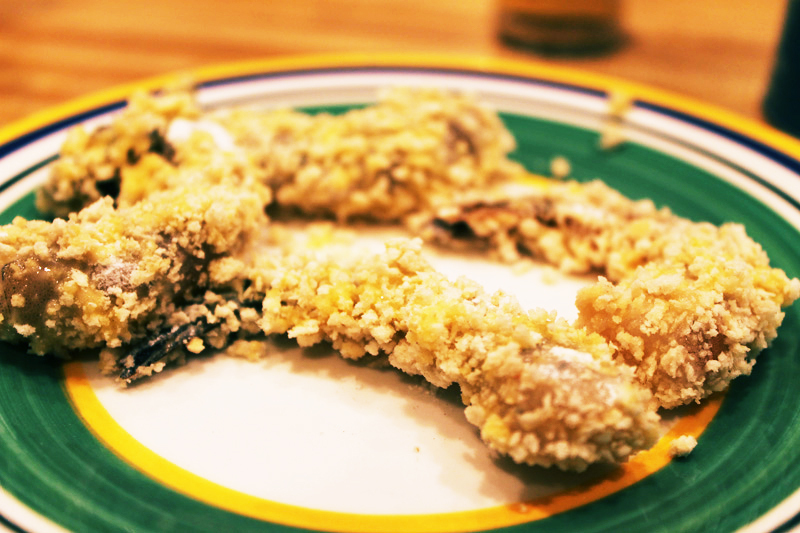 As I cooked it, the nori became a second skin to the fish, and the flavor mixed perfectly. Once the dish was complete, it was like a maki roll, deconstructed on the plate. A bite with all of the components of the plate really felt like I was eating an interesting roll at a sushi restaurant! Ty, looks good, do you think you could use this recipe on a grill? You could definitely grill this! 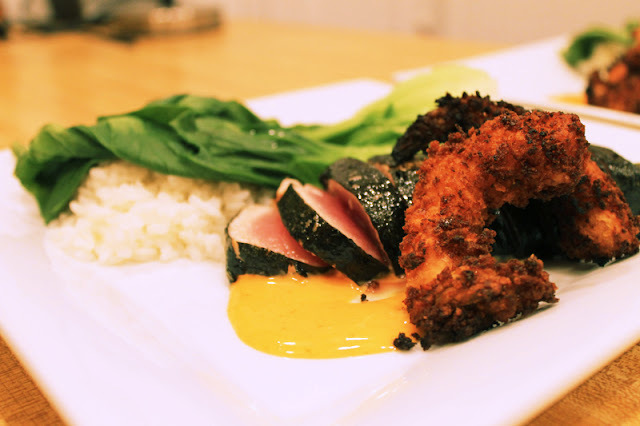 Because tuna is so good rare, you would only need about 1-2 minutes per side, so the nori wouldn't burn too much. Let me know how it turns out if you try! Wow... This is so refreshing. I loved this green colored recipe. You have used all the fresh vegetables in it which is good and healthy point about this recipe. I will follow it.